The SapTrap Toolkit is a collection of plasmids that streamlines the production of targeting vectors for tag insertion using CRISPR/Cas9 and the selection of C. elegans strains. SapTrap, a Toolkit for High-Throughput CRISPR/Cas9 Gene Modification in Caenorhabditis elegans. Schwartz ML, Jorgensen EM. Genetics. 2016 Feb 2. pii: genetics.115.184275. [Epub ahead of print] PubMed PMID: 26837755 . SapTrap is a modular toolkit for building CRISPR targeting vectors to insert genetic tags in the C. elegans genome. 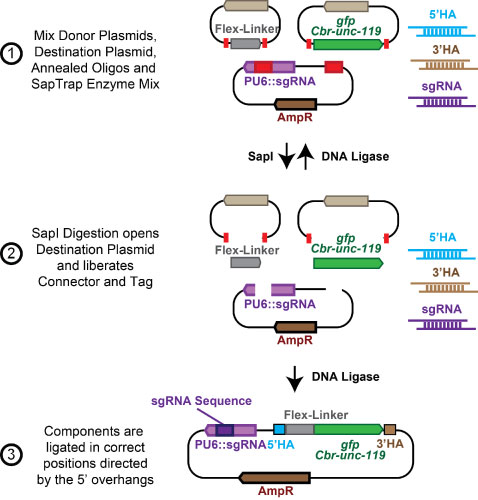 The SapTrap reaction produces a single plasmid targeting vector that encodes both a guide RNA transcript and a repair template for an individual tagging event. The kit contains 26 plasmids; 21 of the plasmids are for use in SapTrap reactions for targeting vector assembly, and the remaining 5 plasmids include Cre and FLP expression vectors, a general cloning plasmid, and a prebuilt Unc-32::GFP targeting vector. Plasmid Assembly Pipeline. Figure S2 from Schwartz et al, 2016. PubMed PMID: 26837755 . Courtesy of Genetics Society of America.